Would you like to have access to Salesforce on the move, too? Would your field sales be more efficient if customer visits could be prepared on the move and orders placed directly during the appointment? Would your consultants like to record times on their smartphones? And your logistics specialists plan routes and document visits on the move? For all staff who are on the move for a large part of their work – whether they are members of the field sales team, sales reps, logistics specialists or maintenance staff – applications on mobile devices are very helpful. But these only really boost efficiency if they are connected to the CRM in the company – in other words, to the back office. The field sales team can then obtain a 360° view of the customer and his history and can provide him with a better service on the ground. The team can immediately access queries, product availabilities and orders and document their visits on the ground. In turn, the back office receives incoming orders in real time and can process them more quickly. Greater customer satisfaction is guaranteed! We can map your Salesforce processes for you on your mobile devices. Standard processes can be handled very easily and quickly with the pre-defined Salesforce1 solution. For more complex processes or individual requirements we provide customised programs. We will be happy to advise you on the most cost-effective and beneficial approach for you, to take your company forward. In Salesforce1, all Salesforce customers have at their disposal a mobile app that makes it possible to carry out standard processes directly from a mobile device. And all without any additional licence costs! This state-of-the-art application can easily be adapted to individual requirements by configuring it in Salesforce. You can make huge efficiency gains and provide your staff with a modern mobile solution for their work. Many companies have very specific additional requirements regarding the optimal mapping of core processes and the look and feel of an app, or they very often have to have full offline access to data and functions. For these customers, we have developed the PARX Mobile Framework, which allows us to create fully customised apps extremely efficiently. Your tailor-made app can map all of the processes you require, is also available offline and will fit your corporate design. The app can access data from Salesforce, display it on a mobile device and, if required, save recorded or modified data directly in Salesforce again with no media discontinuities or other integration tools. Thanks to the concept of software-as-a-service, the data is immediately available to all users in real time, irrespective of the type of access. 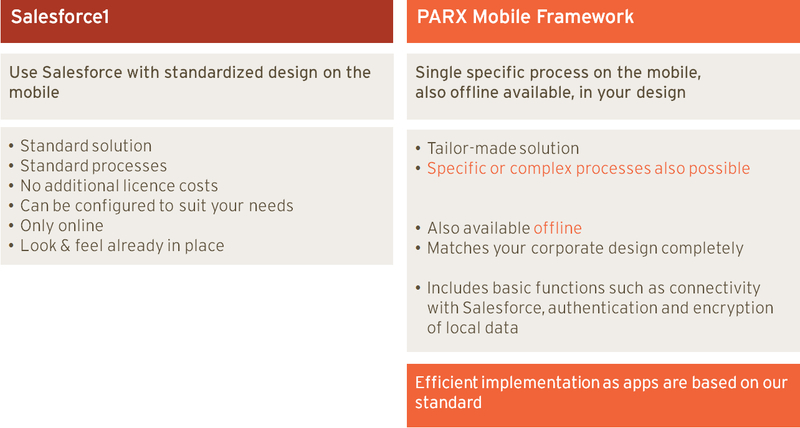 With the PARX Mobile Framework, we can provide you with apps that can also be used offline – data is then saved locally for offline use – and is written to Salesforce when an internet connection is available. As a result, the app runs faster and even in locations in which internet connections are not available (in hospitals, etc.). Would you like to make efficiency gains and make Salesforce available to your staff on their mobiles? Get in touch with us. The innovative bag manufacturer FREITAG greets customers who want to have their bag repaired with an iPad. The app specially developed for FREITAG by PARX writes the data immediately to Salesforce, through which the entire repair process is managed. Just imagine how much easier it would be for your field sales team if they were able to prepare their visits in advance on their tablets when they were out of the office, record meetings with customers directly and place orders. Contact us for a meeting without any obligation. We will show you best practice examples from your industry.